This is the second part of the Nexus documentation series. The first part documents the Basic Kit. This time, we investigate the Mixer Module. Eventually, all of this will end up in a single document. 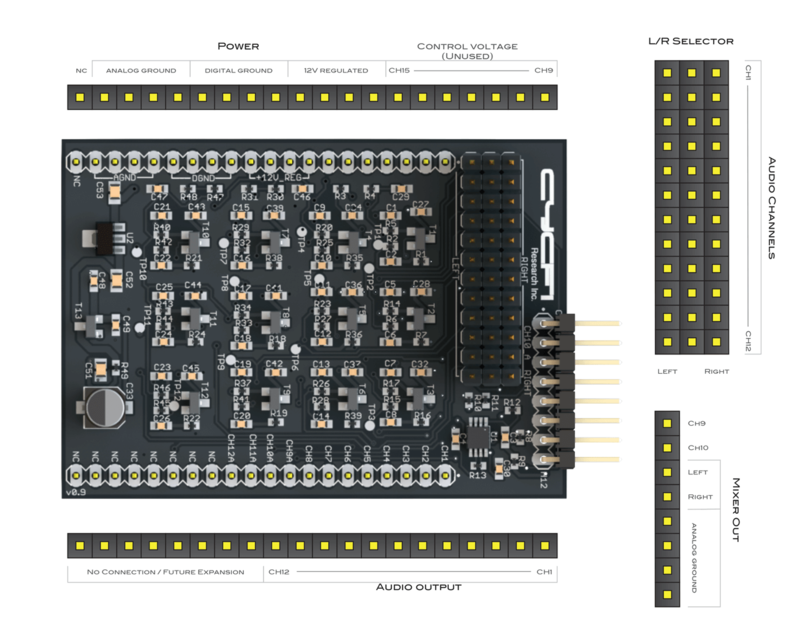 The (optional) Mixer module is a daughter board that sits atop the Main Board (see Basic Kit). This module provides a simple, yet extensible and hackable mechanism for mixing (up to) 12 audio channels down to stereo. Each channel can be mixed to either left or right using the L/R selector configuration headers. The diagram at the right shows the routing for each channel. The center pins connect to the buffered outputs of channels 1 through 12 via 10K summing resistors. 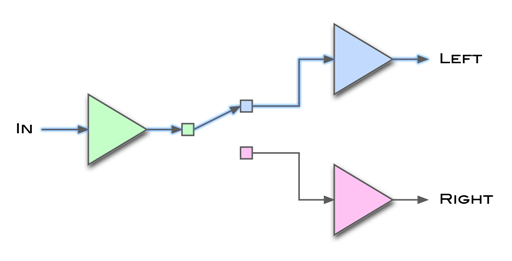 The left and right pins connect to the summing junctions of a dual OpAmp (OPA2209 low noise precision operational amplifier). The mixer gain is -1. Take note that the Mixer module dedicates the back panel channel 11 and channel 12 jacks for the Stereo mix outputs. Typically, for each channel you want to mix, you place a shunt (included) to select stereo routing to either Left (shunt at the left) or Right (shunt at the right). Optionally, these same pins may also be utilized to extend the functionality of the mixer. For example, it is possible to incorporate individual level adjustment by simply adding external potentiometers (or trimmers). Or, if you are up to the task, you can use these pins to add pan controls, channel EQ or insert effects. L/R Selector Mixer configuration pins for Channels 1 to 12. For each channel (1 to 12) you want to mix, place a shunt to select stereo routing to either Left (shunt at the left) or Right (shunt at the right). The center pins connect to the buffered outputs of channels 1 through 12 via 10K summing resistors. The left and right pins connect to the summing junctions of a dual OpAmp. Mixer Out These right-angled headers include channels 9 and 10 output pins from main board plus the left and right channels (which repurposes what used to be outputs 11 and 12). Use these pins when connecting to the output board (see Basic Kit). Audio Output Multichannel Output Channels 1 to 12. These pins are propagated from the main board. Control Voltage (Unused) Control Voltage Output Channels 9 to 15. These pins are propagated from the main board and are unused in the Mixer board. Analog Ground Ground path for noise sensitive analog electronics. Digital Ground Separate ground path for typically noisy digital electronics. . These pins are propagated from the main board and are unused in the Mixer board. 12V Regulated Regulated 12 volts power distribution. NC, No Connection / Future Expansion These pins are unused in this version of the Nexus and are reserved for future expansion.